Garden City hosted its annual 61st Rocky Welton Invitational last weekend, one of the state’s top tournaments. The 42-team competition draws squads from multiple states as well as many of the Kansas’ top teams. Among Kansas schools, Garden City-Brown took second to Goddard and fourth overall with 141.5 points. GC had six top-six finishes, including three runner-ups. The Garden City-White squad was No. 37 with 24 points. The Brown squad, composed of the Buffs’ top wrestlers, also defeated all four Western Athletic Conference teams – Dodge City, Great Bend, Hays High, and Liberal – that were at the competition. Great Bend has been a top-10 5A squad throughout the year. Last week, Dodge City was fourth in the 6A rankings, and Garden City stood fifth. GC has a long history of great wrestling, including a fifth-place finish at 6A state last year, third place in 2017 and state titles from 2013-16. This year, the Buffs, with all of its top wrestlers as non-seniors, should again contend for a 6A crown with the likes of Derby, Manhattan, Washburn Rural and Dodge City. Garden City-Brown tied for the tournament lead with three technical falls and led with least fall time (11:09). Brown also tied for third with plus-37 in largest seed/place difference. White was seventh at plus-29. At 113 pounds, junior Silas Pineda (31-8) took second. He won a match by ultimate tiebreaker in the semifinals, and then fell 6-0 in the championship to Jacob Gonzales of Pueblo Centennial. At 120, junior Diago Hernandez (28-8) finished fifth, including a 7-5 sudden victory in his last matchup against Ethan Andrade of Lamar (Colo.). The two also met in the quarterfinals and Hernandez won 8-7. Andrade is 31-5 this winter. At 126, freshman Erik Dominguez (21-14) placed seventh, including a 3-1 victory in his final match against teammate Steven Sellers, one of two victories against Sellers in the tournament. In the Class 6A rankings last week, Pineda was second, Hernandez sixth and Dominguez sixth. Sellers, who took eighth, had a great showing and had a plus-18 seed/place difference, tied for the fifth-biggest of any wrestler. Sellers is 11-15. He had a big upset in the first round when he defeated Great Bend’s Carsyn Schooler, 8-5. Schooler was ranked No. 6 in Class 5A last week. Sellers tied for fifth in seed/place difference with his teammate, Josh Janas, who was seeded No. 23 and took fifth at 138. At 132, junior Jacob Holt is ranked first in 6A. Holt (28-3) delivered one of the tournament’s top highlights with a quick late takedown of Zeke Marquez in the semifinals for a 6-5 victory. He finished second. At 138, Janas, who is unranked in 6A, improved to 25-14 and finished fifth with a big run on the backside. Janas lost his first match by fall in 4:56. Then, he ran off five straight victories by fall, technical fall, a 7-0 decision, an injury default and a fall in a minute. After a loss, he defeated Goddard sophomore Jace Fisher, ranked second in 5A, in a 7-5 decision. At 195, junior Alex Rodriguez, who was sixth in 6A entering the competition, took second and was the team’s top scorer with 27 points, one ahead of Pineda. He had three wins by fall in 2:42, 1:20 and 5:20. In the semifinals, Rodriguez delivered an 11-2 major decision versus Colby’s Hagan Booi, who was ranked second in 3-2-1A. Rodriguez (32-6) fell in the finals. At 285, GC junior Refugio Chairez (16-5) took fifth in a loaded weight class. He is ranked second in 6A. 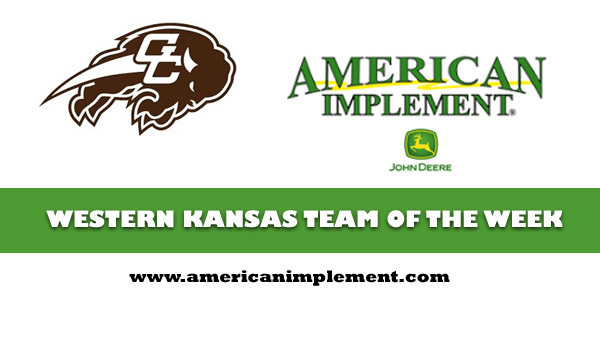 Amerian Implement is a proud supporter of high school athletics and coverage from Sports in Kansas. Check out locations, online inventory and promotions now at American Implement online by clicking here! Nominate a Western Kansas Team of the Week here!